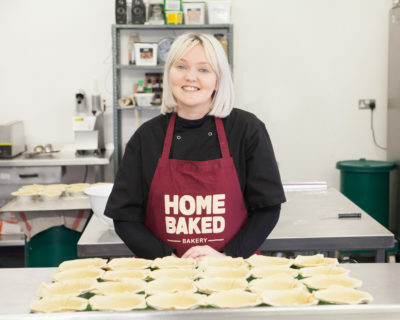 Homebaked, a community-run bakery and land trust in the heart of the Anfield district of Liverpool, has this afternoon made it into the top three of four award categories at the British Pie Awards, taking away 3 gold medals, 3 silver medals and 2 bronze medals, that puts them amongst some of the top pie producers in the country. Modern day legends to Liverpool’s pie scene and frequented by the likes of Robbie Fowler, Ian Callaghan, David Fairclough and Tom Kitchin, Homebaked was set up by local people who took on a disused bakery on the corner of their street and breathed new life into the area, near Anfield stadium, all but abandoned by the local council. Highly commended in four categories of the annual awards organised by the Melton Mowbray Pork Pie Association, Homebaked has been baking pies on the site since 2013. But these are no regular pies; profits from each go straight into the local area, creating training and volunteering opportunities, teaching baking to local schools, running a young people’s business scheme and creating affordable housing. An ever-growing number of local people are setting up and running community businesses in their villages, towns and cities and there are now nearly 7,000 in England alone. And it’s not just hearty pies on offer, they run everything from affordable homes to community transport, offer a local pint to renewable energy, salvage piers, local libraries and post offices. What all these businesses share is that they are rooted in a local area, run by and answerable to members of the community, and make a trading profit to re-invest in doing more social good locally. Thanks to the grant from Power to Change we were able to buy a pie machine, an enormous freezer and pay for Luke our Operations Manager’s salary for 12 months. This investment enabled us to secure a contact in partnership with Liverpool FC for 700 mini pies per game. We’ve also secured wholesale and event contracts across the city and are catering at two weddings this month! Power to Change, the independent trust supporting community businesses in England, says the environment has never been better for community business which it estimates currently have a total market income of £1.2 billion, 35,500 paid staff and 119,500 volunteers. 63% reported feeling confident about their financial prospects for year ahead contrasting dramatically with small business confidence reported by the FSB. Indeed, Homebaked says it can measure its market growth in the number of pies they sell, which has risen from 500 a week in 2015 to 2,000 a week now. Two grants from Power to Change meant that they could buy the pie machine that got them started on the road to culinary success and then refurbish the flat above the bakery for rent to local young people. This award-winning business is now completely self-sustainable and having a significant impact in the regeneration of the local area. Liverpool is the capital of community business in England right now and right at the heart of its success in Anfield stands Homebaked. Who doesn’t love a pie; even more so one whose profits support the community they hail from. About Power to Change: Power to Change is an independent trust, whose funding is used to strengthen community businesses across England. At a time when many parts of the UK face cuts, neglect and social problems, we are helping local people come together to take control, and make sure their local areas survive and stay vibrant. Visit www.thepowertochange.org.uk for the latest community business news.